The purpose of this plan is to guide the NPS and its partners in adequately addressing the invasion of the lionfish in the marine waters of National Park System units in the Caribbean, the Gulf of Mexico and the east coast of the United States. 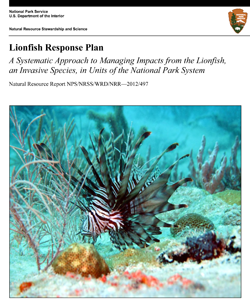 The plan describes Service-wide approaches for lionfish management and then guides park managers and staff in developing site-based plans specific to individual park units and conditions. Specific actions to prevent or mitigate resource impacts, to protect health and safety and to communicate the story of the lionfish invasion to partners, cooperators and the public are described. While this plan specifically applies to the waters, resources and visitors of the units of the National Park System, the plan recognizes that close coordination and cooperation with other agencies and organizations is essential for success.